« Arsenal in the 70s part 10. Jan to June 73 – being screwed by the league and the prelude to deep decline. Arsenal in the 70s part 9: July to Dec 1972. The time of indiscipline and invasions. Arsenal returned to training in July 1972, without a new trophy in the cabinet. But in the past five years they had won the league, the Fairs Cup, and the FA Cup. They had twice been beaten finalists in the League Cup Final, and once beaten in the FA Cup final. It was quite a time. Arsenal played their first pre-season friendly in July with no new additions to their squad. It was, as was commonplace at the time, a match against Watford. The full results of the pre-season series were. 4 August 1972: Hamburg 4 Arsenal 0. Arsenal’s problematic player Marinello played in three of the four games. During the friendly period Arsenal made their one venture into the summer signings market, and on 28 July 1972 David Price signed professional forms having joined Arsenal in 1970, and went on to make his first team début aged 17 in the end-of-season game against Leeds on 9 May 1973. As the press occupied themselves with the issues of hooliganism and player indiscipline, the new season kicked off on August 12 1972, and the result was a satisfactory Leicester City 0 Arsenal 1 in front of 28,009. But the match made the headlines because of a pitch invasion by the crowd and the arrest of 28 spectators by police. It was not the biggest football problem of the day however, the game at Chelsea being stopped three times. On the pitch the league launched its new “clean-up” approach and as a result 53 players were cautioned and three were sent off. It was also the first venture into a totting up system with multiple dismissals leading to suspensions. Arsenal had talked pre-season about a new style, and the game was played this was a confirmation of the new Arsenal – a constantly changing of shape and angle, with attacks built more from the wings in the style of 1970/1 rather than the ball up the centre in the style of 1971/2. Ball looked more relaxed than in the previous season, alternating between subtle and forceful in a way that left the opposition bemused and it was fitting that he scored the only goal – a penalty. Arsenal followed this up on August 15 with Arsenal 5 Wolverhampton Wanderers 2, 38,524 watching the game at Highbury. But the worrying news was that Charlie George missed the game, having declared himself in dispute with the club over his wages. This was particularly frustrating in that this was not the first time a player under Mee had had a public row with the club over salary, and it suggested that the autocratic regime that Mee was known for needed some flexibility. However Radford and Kennedy were easily able to sweep Wolverhampton aside (both scoring in the first 15 minutes), and Arsenal would have had more had the man of the match not been Parkes in goal for Wolverhampton. Simpson and McNab added to the fun and Radford got a second. But the main talk of the day was still the number of players booked. 17 more bookings were reported from the matches played on the 15th and the press saw this as much more important than the actual playing of football. As for Arsenal fans it was a good start, and this continued with Arsenal 2 Stoke City 0 in front of 42,146. Arsenal were relaxed, Stoke were submissive – it was a stroll on the green green grass of Highbury. Just how limited Stoke had become in their ambition was shown by the fact that, after going two down they took off their one attacker for a defender in a desperate attempt at damage limitation as Kennedy, having already scored two, looked ready to get two more. Armstrong received a free kick from Storey, played the ball to the far post where Kennedy simply edged it in. Ball played with the ball and annoyed the crowd, keeping the ball on the back of his neck while waiting for someone to come and try and get it off him. At the start of the second half Smith brought down Radford on the edge of the area and Kennedy drove the free kick straight through the wall. Ball moved down the right with Radford running between two Stoke players who wanted to sandwich him. Radford duly headed in but the ref penalised him for pushing, one or the other or both of the Stoke players. Stoke had one shot. Barnett saved easily. Of course no one wins every game as we were reminded on August 22 when the score was Coventry City 1 Arsenal 1 with an attendance of 24,670, Pat Rice getting the goal. In a sense it was disappointing since Coventry had lost two and drawn one thus far and indeed didn’t win a single league game until match number seven. There was still no Charlie George, and Coventry fielded Jeff Blockley. With Arsenal still unbeaten and top of the league, no one really seemed to mind too much, and fullest attention turned to the next game on August 26 which ended Manchester United 0 Arsenal 0, with 48,108 inside Old Trafford. Arsenal looked as if dealing with a very poor Man U team was simply too much to bother with, and the chasm in class between the two sides indicated as much. United had only one decent player – Young. Arsenal at last had Charlie George back, this time in the number 9 shirt (Radford making way due to injury). But Charlie’s appearance ultimately promised more than it delivered and the performance was unimpressive. Armstrong seemed to have left his motor at home, Ball didn’t quite know where he should be or how to get there, and that left everything up to Kennedy. He tried – but like Young on the Man U side – he couldn’t do it all on his own. Best did have one fine chance for the home side but missed an empty net on the turn, and George returned the compliment later in the first half. Three Arsenal players were booked: McNab for pushing, Kennedy for saying the wrong thing, and George for a tackle. Finally however Arsenal got back to winning ways on August 29 1972 by beating West Ham 1-0 at Highbury in front of 43,802. West Ham hadn’t beaten Arsenal since 1966 and really didn’t look like doing so. Charlie George dropped out of the team but came on as a sub for George Armstrong. Alan Ball scored with a penalty. And thus the first month of the season came to an end. Here’s the full league table, just to include what was happening in Manchester. At the top there was Arsenal but somehow nothing had seemed that impressive thus far. September broke with the awful news that Charlie George was now on the transfer list. Bertie Mee was doing his intransigence bit again and Charlie wanted a lot more recognition than he was getting. But on 2 September for the home game against Chelsea he was at least still in the team (even if just as a sub) for the 1-1 draw at Highbury in front of 46,675. Charlie came on as with 75 minutes gone, and seven minutes later was booked for the second time in a week One more would mean a ban under the new regulations. Arsenal scored through a Webb own goal – it was that kind of a game. Mee declined to answer reporters’ questions. With Arsenal still top of the league the clubs turned their attention to the League Cup, with Arsenal taking on Everton at Highbury on 5 September and winning… 1-0. The low scores were getting to be a habit with 35,230 in the ground. Everton and Arsenal sat at the top of the first division going into this league cup game. Peter Marinello had made no contribution to Arsenal’s achievements thus far, as he was making his first appearance since March, aside from the pre-season friendlies, and he decided to remind everyone who he was by providing pass for Storey to score the goal that won the game. Everton had won only 5 of the last 51 games played at Highbury, and they must have feared the worst when on Storey scored from the edge of the area on 35 minutes from Marinello’s pass. Royle totally fluffed Everton’s best chance and Ball missed a penalty. Then Marinello jigged his way pass Lyons and Wright and missed the goal by less than an inch. Arsenal were through, but one goal in a game didn’t really make for great football, and in reality it was not too surprising that the unbeaten run was ended on September 9 with the score Newcastle 2 Arsenal 1. The attendance was 23,849 in a season in which the league average was 31.324 and Newcastle’s average was 32664. It was disappointingly low. As for the game there was a period in the second half when Arsenal equalised and took the game to an injury hit Newcastle – and looked as if they could win it – but the time passed, and on 77 minutes Barnett was caught out from a long range shot from Craig. The ball bounced out of his hands, – and that was that. Indeed much of the game was dull – it took 20 minutes for a shot to get anywhere near the target and it caused the Arsenal keeper no problems. Arsenal played their off-side game, and when Arsenal attacked Newcastle drew everyone back in defence except McDonald. Marinello was once again the odd man out, not getting the ball as much as he should, but after 52 minutes he was in the right place at the right time and lobbed the ball perfectly to Kennedy who scored, but it wasn’t enough. September 16 1972 was one of those games that all of us who will there will remember, although it was to tell the truth a fairly awful match – especially after the “incident”. The game ended Arsenal 0 Liverpool 0 and the crowd was 47,597. That was a little ironic given that the morning’s news was of how low football attendances had sunk – but it turned out to be one of those totally invented newspaper stories based on someone saying “the crowds are going down” and no one bothering to check. In fact the low point was 1963 and 1966 in the first division, and very little change between 1959 and 1971/2 in the top league. Where there was a decline it was in the lower divisions. The match started quite excitingly, but only for 15 minutes until linesman Dennis Drewitt wrenched a knee. The call went out to find another linesman – and up stepped Jimmy Hill from his ITV commentating duties. The pundit running the line made TV news and the title sequence of ITV’s regular football show from then on, and it is fair to say he didn’t do much wrong as a linesman, but sadly the long break between Mr Drewitt withdrawing and Mr Hill taking his place meant that the fast and furious quality of the opening part of the game was never recaptured. Liverpool in the opening period went for strength and speed, which gave them chances but left them open to the counter. Graham, Kennedy and Radford had chances in the first half, Marinello in the second, while Toshack came close for Liverpool, but from that forced break onwards it looked like no one had the spirit to win. But at least the linesman’s injury replaced the regular story of hooliganism, and the new invention of declining crowds. September 23 1972 gave us Norwich 3 Arsenal 2; the first ever league match between the two teams but not Norwich’s first victory – they had beaten Arsenal in the FA Cup in 1954 at Highbury and as we’ll see below went on to beat Arsenal again before the year was out. Marinello kept his place on the wing, but Arsenal were 1-2 down at half time. Radford and Storey scored but it was a poor performance all round and it meant that in the league Arsenal had just one win in seven. The positive feel from being top of the league had drifted away. Indeed not only did Norwich beat Arsenal twice this season, but each time there was a particular story to the game. For the 23 September 1972 match it was that ex Arsenal man Terry Anderson scored twice against Arsenal for Norwich. But it got worse before the year was out. Arsenal meanwhile needed to win, and win quickly, which they duly did on 26 September beating Birmingham 2-0 in front of 32,273 at Highbury (Storey and George scoring), and again on 30 September with a 1-0 win against Southampton with 34,694 in the ground (Graham getting the goal). Despite the poor run, the recovery in the last two games meant that the league table still looked quite promising. The game was becoming rather predictable – the home team normally won. Next up was Arsenal against Rotherham in the league cup 3rd round on 3 October 1972. Both Marinello and George started, and both scored along with Radford (2) and Storey to make it 5-0. The attendance was 25,241. It was John Roberts final game before moving on to Birmingham City for £150,000. He later featured for Wrexham and Hull City and finally for non-league Oswestry Town. He subsequently went on to work as a stationery salesman and as a driving instructor. On the next day, 4 October 1972 Jeff Blockley signed from Coventry City for £200,000. As Arsenal tried to maintain the momentum of the first European success and the first Double, he was signed by the club as a replacement for Frank McLintock, and he came at a time when Arsenal had three wins in a row, scoring eight conceding nil, albeit the last was against a team who would by the end of the season be relegated from the third division. But sadly it was not to last, for on October 7 the result was Sheffield United 1 Arsenal 0 with 24,478 in the crowd and this was Jeff Blockley‘s debut. He came in as a replacement to Simpson and Roberts who had been alternating at playing at 6. However later in the season he did move across to the number 5 shirt. This game was remembered for Alan Ball’s sending off on 69 minutes, after a hatful of fouls through the game up to that point. The press made much of Ball having cost over £200,000, and the fact that Blockley who also cost more than the current magic number helped United to score on 11 minutes when he failed to clear a simple cross. Having scored an own goal last week, the press began to talk of Blockley as a menace to his own team and those fans most readily influenced by the scribblers followed this route, getting on Blockley’s back. Yet despite this view on 11 October 1972 Jeff Blockley won his one England cap. Arsenal’s fine start to the season was starting to look “stuttering” (to use the latest word that the journalists had found in the dictionary), and to be fair stuttering is what it looked like in the next game on October 14 which ended Arsenal 1 Ipswich Town 0 with 34,196 in the ground, and George Graham scoring once again. What we can see from the first 14 league games of the season was that the injuries which Arsenal had avoided in the Double season, were now starting to catch up. Armstrong was injured in the game against Chelsea on 2 September, and Simpson was also replaced after that game by Roberts, Marinello taking over from Armstrong. Roberts lasted five games before losing his place to Blockley. Charlie George made one start in the first ten games before getting a run of ten games in the team. And all the while Bob Wilson, the heroic goalkeeper of the double season, was still recovering. Which is not to say that Barnett wasn’t doing a decent enough job – in the 19 league games he played before Wilson returned Arsenal let in 15 goals – the best defensive record in the first division. So by this game against Ipswich, (league match 14) Arsenal had used 16 players (excluding Sammy Nelson who had come on once as a sub). The previous season had been 15, and the Double season it had been 14. A slight difference perhaps, but significant in an era where new players and promotions from the reserves and youth team were rare. And significant in a period when two players had declared themselves in dispute with the club over wages and a third was about to express his displeasure at how things were being handled. But then there came some good news as on 17 October 1972, six months after injuring his knee, Bob Wilson finally returned to football – coming on as a substitute for the second half in a testimonial for former Arsenal and Plymouth keeper Bill Harper which ended 1-1. The event I am sure would have meant little to Arsenal supporters of the era, which is a shame, but it meant a huge amount to Plymouth fans of some years standing. Bill Harper was the son of a Scottish blacksmith – and when he signed for Arsenal, Herbert Chapman broke the goalkeeper transfer record by paying £4000 for him. At the time he was established as a Scottish international, and indeed he won the Home Championship three times with Scotland. After being dropped however he went to the US to play football, but returned to Arsenal in time to win a league champions medal in 1931. In December 1931 Bill Harper was transferred to Plymouth, and upon his retirement stayed with the club as a trainer, groundsman and general helper – a true stalwart of the club and exactly what lower league teams depend on for their survival. Plymouth did absolutely the right thing by him: not only was he given the testimonial in 1972, but we should also note that Plymouth’s training ground, Harper’s Park, was also named after him. Over 18,000 turned out to see Wilson make a number of easy saves, and he ended up complaining that he didn’t have enough crosses to handle although he had to make a couple of last ditch saves to keep Arsenal in the game. Kennedy scored on 21 minutes, and George almost got a second when Jim Furnell (himself an Arsenal man from 1963 to 1968, and now at Plymouth) tipped his header over. Jim Hinch equalised for the home team with a header near the end. Bob Wilson however didn’t come straight into the Arsenal team, but had to wait for five more games before regaining his place. The first of these “Wilson in waiting” games ended Crystal Palace 2 Arsenal 3 on October 21, with 35,865 in Selhurst Park. Twice Palace equalised Arsenal’s lead and each time Arsenal regained the lead within a minute. But Arsenal’s replies were worthy of the difference in class, as Palace were unable to take the ball and then turn and run – the tactics that are clearly embedded into Arsenal players from day one. The difference was obvious and Arsenal worthy winners. Playing without Ball, Arsenal moved into an end-to-end approach, attacking in numbers with the ball, withdrawing in numbers when the ball was lost. Blockley still looked uncertain, and McLintock looked unsure how to work with him. George scored on the half hour from a penalty after Hinshelwood handled a Radford shot. The keeper pushed the ball against the post – but then it bounced in. Seven minutes into the second half Craven equalised with a volley. A minute later Radford picked up a short back pass and rounded the keeper. 15 minutes from time Tambling headed on and Craven shot home with venom. A minute later Kelly crossed to Rice who moved in to score. October 28 brought Arsenal their third goalless draw of the season, this at home to Manchester City in front of 45,536. In an extraordinary moment, which was caught on TV for The Big Match, Marsh sent an overhead kick towards the Arsenal goal. Barnett palmed it against the post, the ball came to Lee and he appeared to score. With the ball seemingly inches over the line Blockley then got a fist to the ball and the ball came out. And the referee gave… play on. Which Radford did, running to the far end and almost scoring himself, while the City players shouted at and manhandled the referee. Sendings off there should have been for that behaviour, but there were none. After the excitement, and with City feeling aggrieved, the game then deteriorated. Manchester City’s Bell, Cagney and Marsh looked like they couldn’t really be bothered and only Sumberbee looked like making an effort. For Arsenal however with Marinello, Radford and Rice in sparkling form it looked like a game for the taking. But Blockley again failed to look the part and a weak back pass from him nearly gave City an undeserved victory. Arsenal’s best chance involved McNabb and Marinello but when the ball fell to George he blasted it over. It was that sort of day. The month ended with the fourth round of the league cup, which saw Arsenal go through 1-2 away to Sheffield Utd with 20,128 in the three sided ground. Arsenal, it must be said, started poorly, but ultimately goals by George and Radford saw them through. The quality of the play improved throughout, and the match ended with hope that Arsenal might at last be shaking off their recent lack of form. Simpson returned for the first time in two months, but Ball was still suspended and Arsenal started poorly. In the 12th minute a dreadful scramble in the Arsenal goal which led to the ball getting poked just wide. But on 17 minutes Charlie George scored after stunning work by Marinello. Taking the ball on the left wing he moved one way then the other, bemusing everyone before putting in a low centre for George to push home. The second goal came in the 34th minute with United caught short in defence. Graham sent a diagonal pass to Radford who ran clear down the left teasing McAlister who evertually came from his goal as Radford slid the ball past him. Arsenal looked supremely confident, and back to their old style. But then two minutes after the break United put themselves back in contention and immediately pushed forward for the winner, but the pressure did not last long and Arsenal strolled through the last half hour of the game. However there was nothing to hide the slight slippage Arsenal had suffered. Their goal average was down, there were having trouble scoring, and above all were one point behind Liverpool having played one game more. Arsenal needed to put in some serious winning performances to stay in touch with Liverpool at this point, but that isn’t what was delivered, for on November 4 the result was quite shocking: Arsenal 0 Coventry City 2 with 33,699 in attendance. Despite the fact that he had started every game except this and two others George Graham was reported to have expressed his annoyance that he was only a sub for this game. Once again the spectre of Mee broaching no argument and the game (in which Graham came on as a sub for Kelly) was Graham’s last league game for the club. It seemed a terrible waste of a real talent. He had made 219 league starts for Arsenal and scored 59 league goals across seven seasons. Looking back across the decades I can’t help thinking that although on occasions an authoritarian approach might be beneficial, it seems to me that the manager would not allow anyone to question him – which suggests a lack of self-belief. Certainly the decision to leave Graham out backfired in this game (for which Jeff Blockley was made captain for the day against his old team), but thereafter Arsenal went on a run. But by the end of the season the club most certainly could have done with an alternative to the increasingly wayward Charlie George, himself deeply embroiled in a salary dispute over which seemingly Mee would not give an inch. 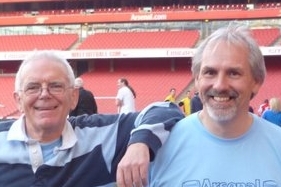 As for the gave, with Arsenal unbeaten at Highbury up to this point and Coventry established in mid-table this looked fairly straightforward – and it was, but for the wrong side. Hindsight is wonderful, and looking back one can say that if only that one match against Coventry had been won, matters could have ended in a very different manner come the end of the season. For in the next game on November 11 we had Wolverhampton Wanderers 1 Arsenal 3 before 25,988 fans. Two goals in the last five minutes gave Arsenal a win to put the misery of last weekend out of their mind. Wolverhampton in fact dominated the first half but without finding the net. Then in the 47th minute Ball took the ball from Bailey, made a perfect long pass to George who crossed perfectly to Radford who scored. Wolverhampton suddenly awoke and on 59 minutes equalised. It looked like this could have be it, but Arsenal launched one counter-attack after another, and after two fine saves from Parker George crossed to Radford who slipped the ball under the keep on 85 minutes. The visiting fans were still singing when George passed brilliantly to Marinello who waited for Parkes to rush him, and then scored the third with wonderful coolness. Then there was a brief pause for Armistice Day. Arsenal’s tradition of playing a French team with the money taken going to Veterans of the first world war was set up by Herbert Chapman. By 1972 the opposition had changed but the context was still the same and on 14 November Arsenal travelled to France to play a Paris XI, beating them 1-0 with a goal from Rice. Perhaps most importantly from a football point of view, Bob Wilson once again played in goal. Three substitutes were used: Batson, Hornsby and George Armstrong, who had not been seen since September 2. Back from Paris the good news continued as Arsenal beat Everton 1-0 at Highbury on November 18, with 35,728 in the ground. Radford scored – his seventh league goal of the season. It wasn’t a great game, indeed it wasn’t a memorable game. But it was a win. But then, somehow, Arsenal once more lost the plot. Having been beaten away by Norwich for the first time was one thing, but to lose again, on November 21 in the league cup, at home 0-3, was just bizarre. OK, it was just the league cup, but it was the quarter finals, and when the tie was drawn it was considered a fairly easy game for Arsenal despite the fact that Norwich were in the upper part of the table. The crowd of 37,671 certainly took it seriously but it seemed that Arsenal felt their passage to the semi-final was already secure. The problem for Arsenal was that one man in the Norwich team chose this as the moment to write himself into history: Graham Paddon a midfielder. He scored all three Norwich goals in 35 minutes. (He later went on to play for West Ham, but was tipped at the time for one of the big clubs and a big career). As for Norwich they went on to beat Chelsea home and away in the semi-final and lost to Tottenham in the final. But this success contributed to a league form collapse and they went from the upper reaches of the league to one place above relegation, missing the drop by two points. Clearly Arsenal were shocked for this was the regular team that had played against Norwich, and a recovery was needed on 25 November against Derby at the Baseball Ground. Derby were sitting 15th in the league, having won three, lost two and drawn one of their last six. And they beat Arsenal 5-0. 31,034 watched the game. And whisper it quietly, in goal, Bob Wilson made his return – playing his first league game of the season. Perhaps the score shocks us more today than it did then – after all Arsenal had lost 5-1 to Wolverhampton the previous season, and 5-0 to Stoke in the Double season. So we would recover. Of course we would. We were sure we would. Before the month’s end however there was a sad piece of news for on 27 November 1972 Henry White (known as “Bert”) died. After playing 101 league games for Arsenal scoring 40 goals, between 1919 and 1923, and being a member of the London Challenge Cup winning side of 1922, he moved on to Blackpool, and also played first class cricket for Warwickshire. But this was not so good. Three points behind and we had played a game more, and after those last two results it would have been a brave man who predicted eight wins and three draws in our next 11 league games. But that is just what we got. In a sense the two most important games came first – seeing off the old enemy from the last couple of seasons Leeds Utd 2-1 at Highbury on 2 December with 39,108 in the ground. Ball got a penalty and Radford the other. Then one week later we went down thee road and came away with the spoils, for on December 9 it was Tottenham Hotspur 1 Arsenal 2, Storey and Radford doing the honours in front of 47,505 at the Lane. And here is the bonus – a copy of the Big Match is available to watch on You Tube. I recommend it – ten minutes of glorious history and a lovely discussion at the end about off side. The following weekend it was Arsenal 2 West Bromwich Albion 1, with Radford scoring for the third game running, and Arsenal getting an own goal to win the game. The crowd was only 27,119, but it was that notorious shopping weekend before Christmas. The day before Christmas Eve gave Arsenal a draw away to Birmingham 1-1 with Kelly getting the goal and 32,721 Christmas celebrating fans in the crowd, followed on Boxing Day with a spot of revenge against a rapidly sinking Norwich who could think of nothing but the league cup. It ended Arsenal 2 Norwich City 0, in front of 39,038. Radford scored again making it seven goals in eight, with Ball getting the second. On 27 December 1972 George Graham was sold to Man U for £120,000, and the footballing year ended on December 30 with a goalless draw at Stoke in front of 24,586 supporters, leaving the league table showing Arsenal back in second place, but three points behind and having played a game more. Norwich, the earlier nemesis, was down to 14th and still sinking, and bottom of the table: Man U. Arsenal in the 70s, part 4: What went so right in 1971, and why did it then go so wrong? Arsenal in the 70s, part 5: After the double, double doubts. 3 comments to Arsenal in the 70s part 9: July to Dec 1972. The time of indiscipline and invasions. Just heard Bob Wilson talking on BBC fivelive about ‘an England international’, I presume Alan Ball, leading a delegation to Bertie Mee during the 1972/3 season asking for the coach to be changed. Doyou know anything about this? Who was the coach? Steve Burtenshaw was the coach forced out – he left at the end of the 1973 season. But for the moment I can’t remember or see in the records who was the coach after him. Anyone know? I believe it was Bobby Campbell who sadly died this year.